Painting the Rock. Dancing the night(s) away in the dance marathon tent. Northwestern isn’t exactly shy when it comes to huge campus traditions. However, we have plenty of lesser-known campus quirks. One more obscure but equally eccentric campus story would be the esteemed Dr. Eberhard’s Halloween show. Imagine, if you will, a lecture hall filled with students for a Chemistry class. Okay, that sounds normal enough. But every Halloween, this lecture hall magically transforms into a concert venue, as student groups from across campus join forces with Dr. Eberhard himself to put on a dazzling show filled with colorful pyrotechnics, dancing, and live music. I’ll be honest – interacting with this show is the closest I’ve ever come to being in a Chemistry lecture. But if other Chemistry classes are anything like what I saw during my time in the show, please excuse me while I go meet with my advisor to change my major. I walked into the lecture hall as it had begun to fill with excited first-year students who had clearly heard rumors about what was about to happen. Wearing my green jersey and tap shoes, I was representing TONIK Tap, the tap dance group I perform with on campus. TONIK was continuing a longstanding tradition of dancing in the show, but I was a bit nervous due to the nature of our dancing: every year, TONIK tap dances on contact explosives. As a first-time Eberhard dancer, the image of blowing up as I shuffled along in front of hundreds of students wouldn’t leave my mind. No other members of TONIK had explained to me what actually happens, so I sat there completely unknowing as different worst-case scenarios filled my head. In the lecture hall waiting to dance, I watched as groups like the Northwestern Marching Band entertained students with their music. 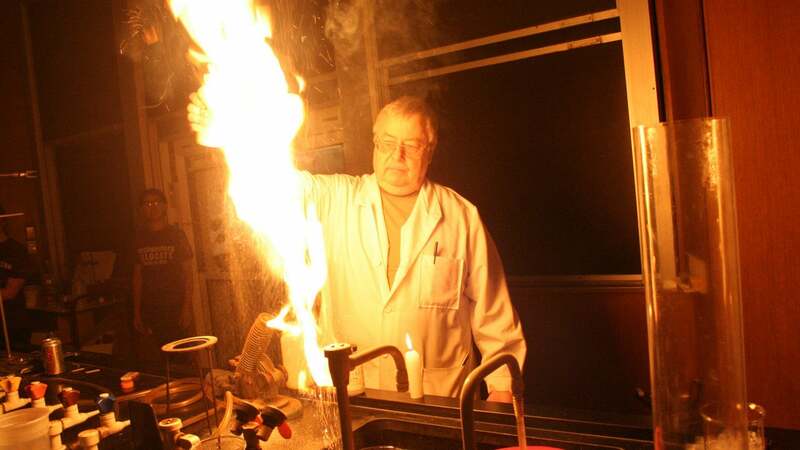 With the lights turned off, Dr. Eberhard’s lab assistants filled the room with a dazzling array of colorful lights and fire from various chemical mixtures. To me, this is the essence of Northwestern – incredible collaboration between student groups and academic departments to bring the pages of textbooks springing to life on any given day. Finally, it was our turn to dance. Lab assistants started putting a chemical compound all over the top of a table that we’d be tapping on. My friend much more knowledgeable in Chemistry told me she thinks it was Nitrogen Triiodide. We got up on the table, and as we danced, there would be loud pops under our feet. It reminded me of those little firecrackers that you’d throw to the ground as a kid. I have to admit, it wasn’t quite as intimidating as I’d imagined it would be – I lived to tell the tale.